Optical activity, blue light. Chiral molecules (eg sugar) cause rotation of the plane of the linearly polarized light when it passes through the sample. Optical activity of sugar is demonstrated by placing a beaker with corn syrup on top of an iPad. Its LCD screen acts a source of linearly-polarized blue light. An analyser (linear polarizer) is placed on top of the beaker. 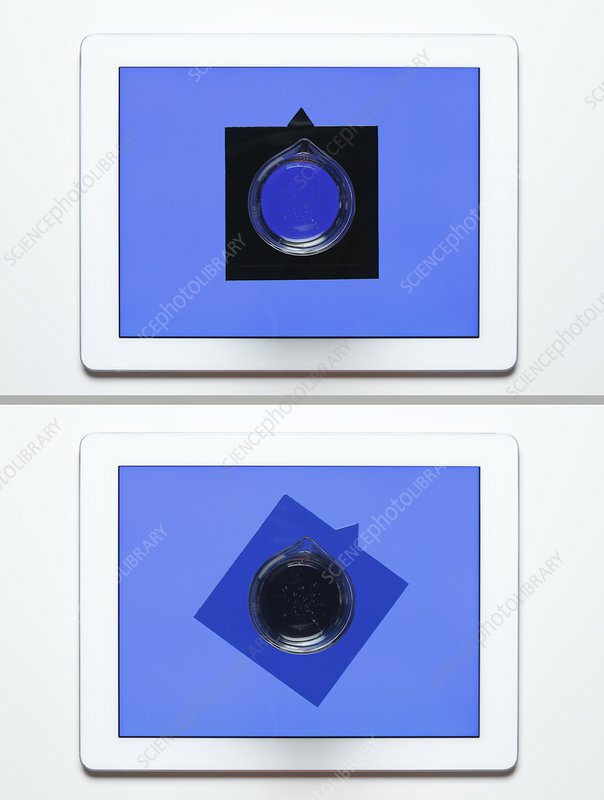 First the analyser is rotated so that minimal amount of light passes from the screen and through the analyser, BUT NOT through the sample (top frame). Then the analyser is rotated so that minimal amount of light passes through the sample AND the analyser (bottom frame). The difference between the two analyser positions is the rotation angle.